At Google IO this past June we saw the launch of many new products from Google, including Android M, Android Pay, and Project Brillo. 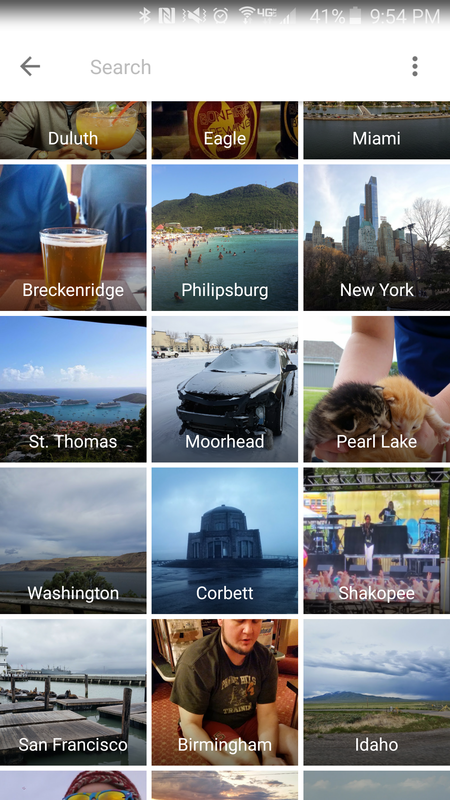 The tech giant also launched Google Photos as its own service, which was previously tied down to Google+. Today we're going to dive into every corner of Google Photos and my experiences with it over the last few months. Over the last eight years I have used iPhoto, Aperture, Lightroom, and Photos on Mac to organize my photos. While each worked for a period of time, I never truly felt like my photos were properly organized. All of the pictures I have taken over the last three or so years of having an Android phone were backed up to Google+ Photos. I would sometimes upload photos taken on a point-and-shoot to my Windows desktop, and sometimes I would upload to my Mac. Most of my GoPro pictures have spent a long time sitting on an external hard drive. I have increasingly spent less time organizing pictures. Partly due to laziness, and partly because I knew I would never get all my pictures properly organized into one library. I have been wanting to organize them, sort them, do something with them for a long time but haven't had a chance. So I decided to take all of my pictures from all of their separate locations and put them into Google Photos. Google Photos is laid out into three different sections, Assistant, Photos, and Collections. Photos is the primary page when you open the app, and is where all of your pictures are located. Assistant is the new name for what was previously known as Auto-Awesome. Stylized pictures, GIFs, videos, and collections all sit here waiting for your approval to add them to your photos. If there is a creation that you don't like, you can swipe it away and never have to deal with it in your library. The last section is Collections, where your albums, movies, and stories are permanently located. The first thing you must do when using Google Photos is choosing which upload setting you want. The "High Quality" option has free unlimited storage, but compresses images that are greater than 16MP. The "Original" option uploads all of your photos in their original resolution, but requires Drive space to be purchased. I chose the new “High Quality” setting because all my pictures are from devices <16MP, the unlimited storage is very appealing, and because I trust the compression that Google applies to these images for my larger images. At first I didn't know if I wanted to take the risk of having compressed photos, so I did a few tests to decide. For this test, I took a GoPro picture (2.3 MB/4000x3000) directly off my GoPro Hero4 black edition. I shot this on the highest possible setting, 12MP. These photos can be blown up on my 60" TV and they still look great. I then uploaded the photo twice. First on the “Original” setting. I then downloaded the image. (I would have uploaded on both settings first, but the duplicate detection wouldn’t let me do it. I'll discuss more later.) 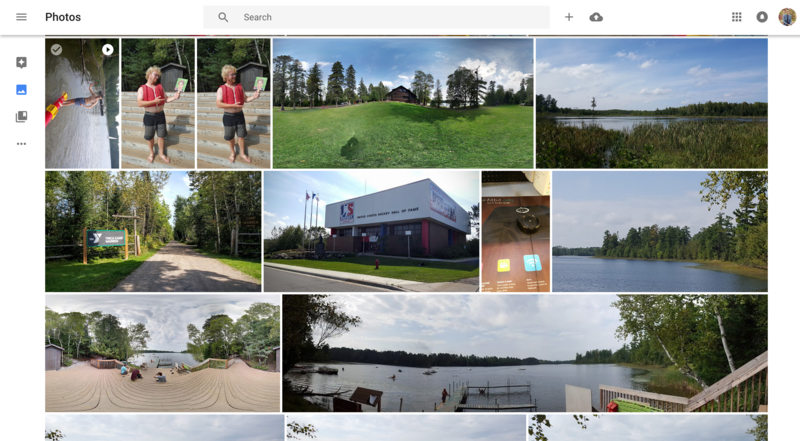 Then, I changed the setting inside Google Photos to “High Quality” and uploaded the picture directly from the GoPro, and downloaded it to my local hard drive. 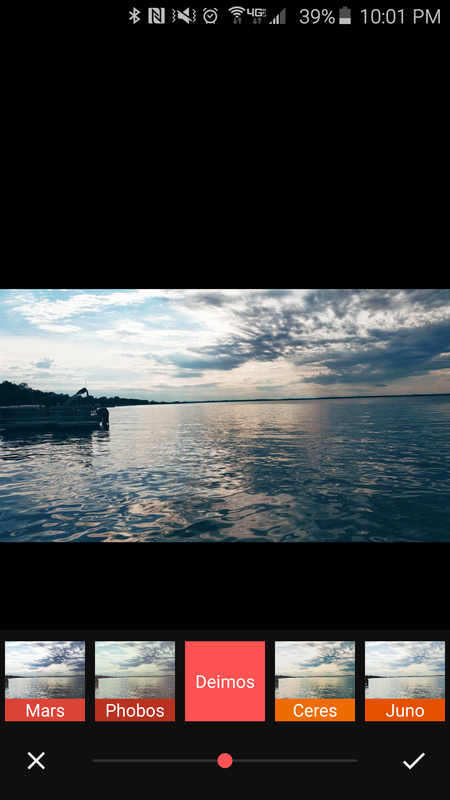 The photo that was uploaded on the “Original” setting and downloaded again remained the exact same. Same dimensions, same size, everything. The photo that was uploaded on the “High Quality” setting and downloaded again was the same dimensions, but the picture size was reduced to 1.6MB (about 70% of the original file size). I used both a retina MacBook Pro and a 1440p monitor to do comparisons. 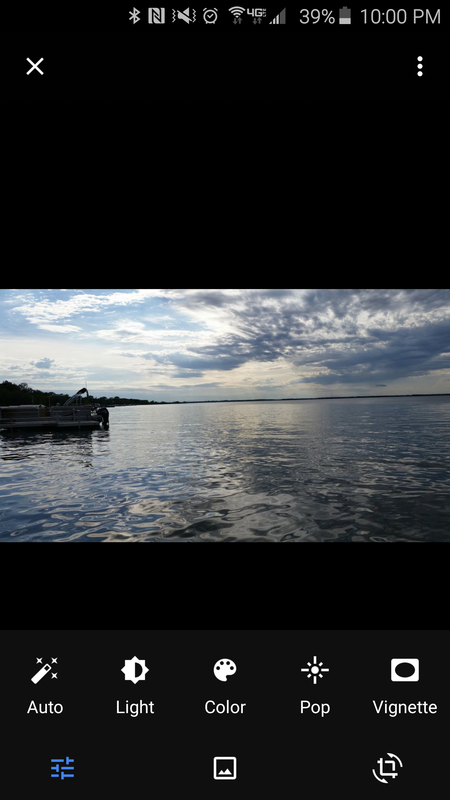 I compared the photo downloaded from the “Original” setting and the “High Quality” setting. Apart from their file size, they are completely indistinguishable. There is absolutely no difference in visual quality, even when zoomed in as far as possible. It is quite amazing actually. Note: I do not shoot in RAW and have no data to support how Google Photos handles these photos, although I suggest you use the “Original” quality setting if you shoot in RAW, or make sure you have local backups or original files. If you're shooting in RAW you probably don’t mind paying a little bit every month to buy a terabyte of space. I ended up comparing the “High Quality” and “Original” images in Photoshop using a difference layer. If the result is completely black, then the images are exactly the same. As you can see above, there is absolutely no difference. It is quite amazing. 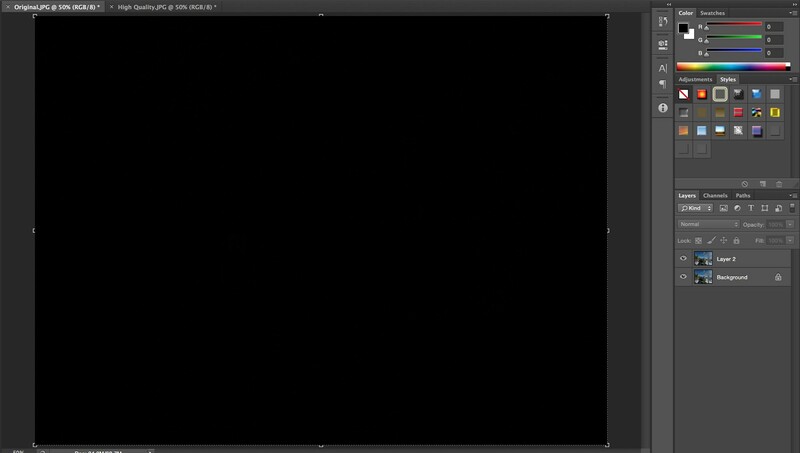 This next image is the result of moving one layer ever so slightly. The differences are shown, and it makes things look very interesting. 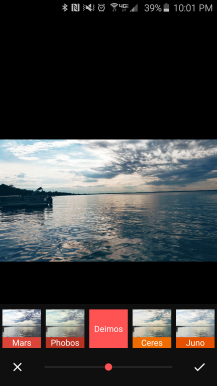 After doing this with a few pictures and seeing that there is no loss of visual quality, I felt comfortable uploading all of my pictures to Google Photos. Duplicate detection is phenomenal. I went on vacation last winter and between a few friends and I we had about 600 pictures. After sharing back and forth with USB’s, our final folder had an absurd amount of duplicates. 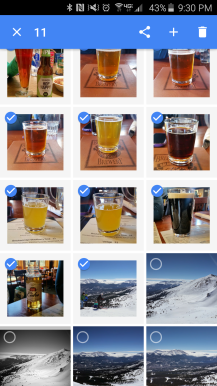 Google Photos automatically detected these and they are nowhere to be seen. I thought this had something to do with file data, but I believe that all images are scanned and compared. To test this I took the “Original” GoPro photo (2.3 MB) and the “High Quality” GoPro photo (1.6MB) and uploaded them both to a new album on Google Photos. After doing so, the album only had one copy of the picture in it. I kept uploading the images over and over again and adding them to the same album, but only one picture ever remained. I feel confident uploading lots of pictures and knowing I won’t have duplicates to deal with. This will save loads of time in organizing and cleaning up, and grant peace of mind knowing I accidentally deleted something that wasn’t a duplicate. The new search categories include People, Places, Things, and Types. These categories are wonderful. Creepy? You bet, but awesome nonetheless. I have found some great pictures I had completely forgotten about while scrolling through each of these categories. For People, Google Photos creates a face model based on the pictures in your library. It then puts all of the photos that contain a face model together for your viewing pleasure. As stated in their keynote, the face detection tags people from years and years ago, which is very cool to see. I don't have any children myself, but having the ability to look back on past pictures would be great. While I love this feature, I found a few issues. There is currently no way to manually train a face model. While the machine learning Google has is very good, it would be wonderful if you could select pictures that contain the model you want to train on your own. I've found myself wanting to do this more and more as time goes on. It is a bit difficult to correct a face model that is incorrect or if there are duplicates. Google thought I was a different person with and without sunglasses. It also thought a friend of mine was a few different people depending on if her hair was up or not. Google does give you the ability to remove pictures from a certain face model but it feels unfinished. Removing a photo from a model is as easy as selecting a picture, or a few pictures, and choosing "Remove from results" from the 3-dot menu. My biggest issue is there is no confirmation when you complete this action. No toast, no dialogue, no notification. This makes your action seem incomplete. If you remove all of the photos from a certain face model, that model still shows up in the list for an unspecified amount of time, and there have been a few instances where the model will reappear later on. If you click on the face you just removed all the pictures from, you get an endless loading screen, which also makes the removal feature feel incomplete. The last issue I found is that photos that get removed from one model don’t seem to appear in another model. This makes joining one person that has two models pretty difficult. The other two categories available to you are Places and Things. Places is probably my favorite, as it's a great way to see all your trips. I have done some additional reading that talks about how it doesn’t use only geotags, but also landmarks in pictures to sort by location. Unlike People, there is no way to remove a photo from a given Place, which is probably due to this category using metadata and landmarks. Things is great at finding things, go figure. From beer to oceans to weddings, nothing went unnoticed. Removing results is available here, and works in the same way that it does in the People category. The last category is Types. On mobile you have the option of viewing Videos, Creations, and photos on Google Drive. Searching for something also works very well. The most useful to me is being able to search for ‘screenshots’, but it recognizes nearly everything I've been able to search for. Note: Face detection is not available in all countries. Sharing has never been easier in my opinion. Being able to pick a few photos and get a private link that another user can immediately add to their library is awesome. This is very helpful for people who are not tech literate. On both mobile and the web there is a “Shared links” section. This lets you see all of the links that you have sent out. From here you are able to delete them if you don’t want them to exist. A small side note, if you go into your settings you are able to remove geolocation tags from photos in shared links. Great for those concerned about privacy. Creating your own stories/movies/animations/collages on mobile is wonderful. No more hoping Assistant (previously auto-awesome) picks it up on its own! I know you have always been able to edit existing Stories, but starting from scratch on your own was a much needed improvement on a great idea. Selecting images by dragging on mobile is convenient as hell. That’s all that needs to be said about that. The editing aspect of Google Photos is developed enough to deserve its own section, so here it is. The interface and options for editing in mobile and desktop are the essentially the same, and very cool. Not as powerful as some applications (like VSCO or Snapseed for example), but they do the job for 90% of things people want to do. 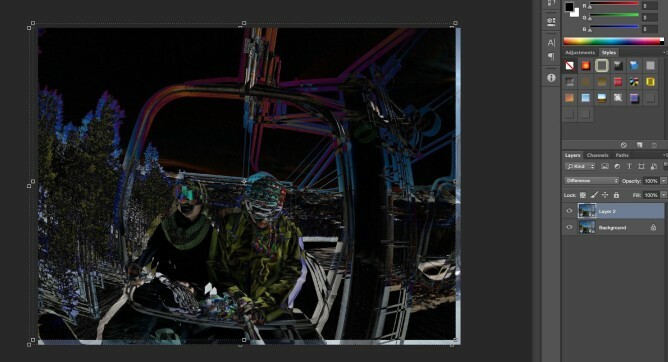 Editing a photo is non-destructive. However, mobile and desktop have different ways of saving photos as to not be destructive. When you edit a photo on mobile in any way and click save, it automatically creates a new copy. This new copy has all the same metadata properties as the original. 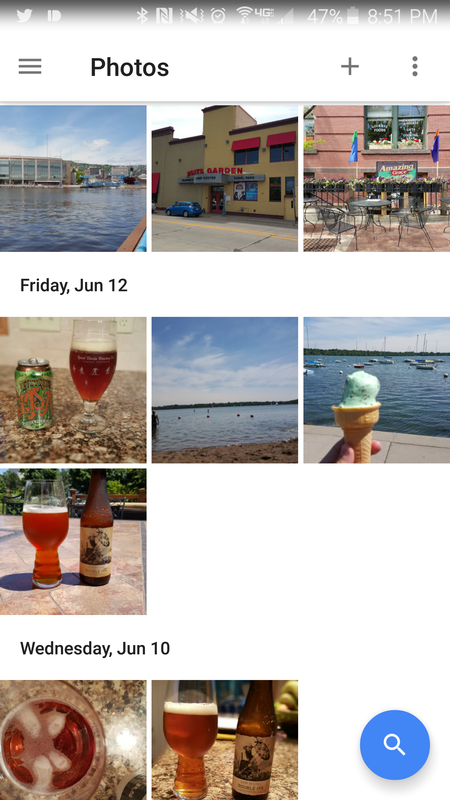 (I mention this because I read a post in the last couple days that was complaining that Google Photos put edited photos under “Today” instead of the date they were taken.) You now have the edited version and the original version. The web application is located here for those who don't know yet, and there is a little more flexibility in exactly what you want to do here. If you edit a photo and click save, the original picture is overwritten and the only photo in your library is the edited version. No matter what edits you do, or the number of times you edit, you are always able to revert back to the original very easily. Once you edit a photo you are also able to click the 3-dot menu button and choose “Save copy”. This, as expected, saves a copy of the edited version. You now have the original and the edited file in your library. Once again both have the same metadata. Please note if you choose “Save copy”, then edit that picture again, “Revert to original” reverts the photo back to the original edit. “Save copy” creates a brand new photo with a new original state. This might be obvious to some. Throughout the last few months there are a few things I have found that would improve the overall quality of the Photos application. I'm a fan of lists, so here are a few lists. If you haven't taken any pictures that Google feels are worth making something out of (collection, animation, etc. ), the Assistant page can feel very empty. It will occasionally show you a card for images you took on this day x years ago, but that hasn't happened very often in my experience. While I praised the ability to share earlier, and I stand by that, I wish there was a way to contribute to a shared album (folder) like you are able to do in Drive. Any pictures that are uploaded to that album are automatically distributed to all others in the shared folder. However, I see how this could cause some spam issues if someone maliciously uploaded a bunch of photos to a shared album. I’m sure there could be some fail-safes built into this. There is no way to manually edit most of the metadata, which is a bit annoying. You are currently only able to add a description and edit the date. I have found out that searching for a description currently doesn't work. I would love to see the ability to easily and completely remove a given face model from the list. With thousands of pictures of school events, vacations, etc., I have a lot of random faces in the background that Google picks up. On mobile you are able to zoom in and out to move from single images, to days, to months, which is a great effect. I wish you would be able to go further up one more level to seasons or years. The fast scroll on the right is unique to the Photos application, and is very useful. On the web app search under “Types,” you get a “Recently Added” section. This does not appear on mobile, but I wish it would. Useful for when you add old photos but aren’t sure of the exact date. You’re able to search other ways, but consistency across platforms is important to me. My biggest issue: There is no chromecast capability! No icon, nothing hidden in the menu or navigation drawer, nothing. Throwing pictures up onto my living room TV with chromecast was amazing. Showing vacation photos to friends/family was a breeze. I could even bring my chromecast to my grandparents house and show them pictures with only a few minutes of setup. 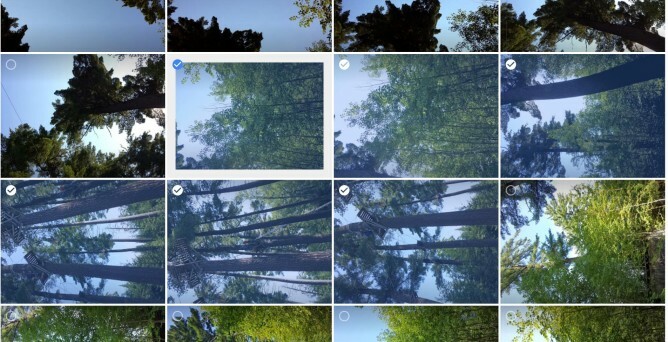 It simply shocks me that I am unable to do this with the new Google Photos. You are unable to scroll or zoom in an album. This becomes a challenge when you have large albums. There needs to be some mechanic that allows you to quickly navigate through an album. There is currently no way to “Remove results” on web. This seems like a simple oversight that I hope is added in the future. The web app does not let you zoom! There is a scroll bar on the right hand side that allows you to scroll backwards in time, but it doesn't do as much as I would like. Being able to zoom into days/weeks or zoom out to months/years would be awesome. The Photos application on OSX does this and it looks really good. I don’t want to start the Apple vs. Google debate, but it is a very neat feature built into the OSX application that I would like to see inside the web app. The horizontal 3-dot menu on the left hand side seems redundant with the nav icon above, but that’s me being picky. 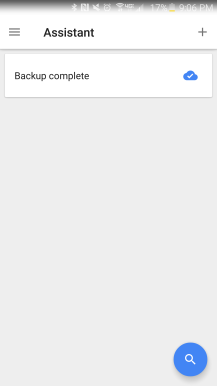 Another thing I’d like to see get implemented into the web app from mobile is drag to select. You are able to [Shift+Click] to select a large number of pictures, but having the drag to select would be convenient. 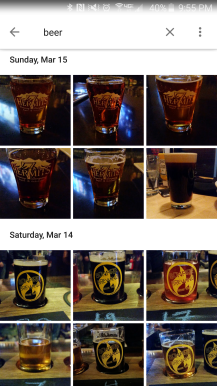 I want to first discuss uploading through the Photos web app. When Photos was first launched I ran into a lot of issues uploading Photos through the web interface. My primary issue was that when uploading more than around 400 photos this way, they wouldn't be added to the face model search. Since launch, there have been quite a few improvements to uploading, and I no longer have these issues. Another issue was an invisible data cap on uploads, but that was fixed in July. I knew that I wanted to upload my entire library to Google Photos; with unlimited storage space under the “High Quality” setting it was a no brainer. The issue I had is all of the pictures I uploaded before the unlimited storage option was made available were taking up my precious Drive space. I felt that the only solution to this was to manually download, delete, and reupload these photos under the new quality setting for unlimited uploads. Having this be done automatically by Google would have made the entire process more streamlined, but I understand that there were probably many things to consider when choosing how to allocate space for old photos. Throughout this testing process I purged my Google account of all photos a few times. I went as far as going into the Picasa web app and manually deleting empty albums. I found that deleting photos from Google Photos still leaves empty dated folders somewhere on Google’s servers. These empty albums are only visible through the Picasa web app. I believe it is now discontinued in favor of G+ Photos, and now Google Photos, but you are still able to access it through a no-redirect link. During this purging process I found a couple points of interest. I'm not surprised by this, but Google seems to cache some information about your photos. After deleting every photo associated with my Google account, I was not shown the default “You have no pictures!” screen. Instead I was shown empty gray boxes. It seemed like it was just waiting to load, but with no pictures available the gray boxes just stayed. I could even scroll back as far as I had pictures dated to. There doesn’t seem to be a way to completely delete all of this information. The search feature also uses some cached information. The “Faces” section would sometimes show people that were previously found. When clicking on a face after purging, it shows the standard no results page. The “Places” and “Things” categories also had squares with labels that correlated with old photos. Clicking these would produce the same result. There have been a lot of issues with syncing between Photos and Drive. As it stands right now, there is a section in Drive called Google Photos, which, as you guessed, has all of the pictures from Photos. There is also a corresponding folder that has a pretty simple year/month structure to organize your pictures. This is nice because it allows for Drive sharing, and it's one more way to view your pictures. I personally love the Photos web interface, but some people enjoy using Drive. You may be wondering why I thought this deserved its own section. It seems simple enough, right? ...Wrong. Users who have previously used Drive to house all their photos are stuck with an unorganized mess of duplicates. Some of you may know people who organize their pictures by using a year/event folder structure. If you use this pre-existing file structure in Drive, your pictures do not automatically upload into albums on Photos. There is also no way to upload multiple albums at a time to Photos. This combination means that Drive users must upload each album they have one by one. With no way to sort albums in Photos into years, Drive users will have to abandon their file structure organized by year/event. The issue that happens with these users is the automatic Google Photos folder that is generated in Drive. 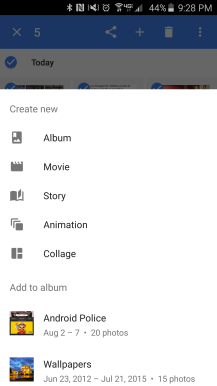 All of the pictures that you manually upload to Photos from your old files on Drive are now duplicated inside this Google Photos folder. This feature can be turned off by going into settings within Drive, but it can create a mess for users who have previously depended on Drive for organizing their pictures. The people who do have their pictures organized this way will have to spend some time manually re-uploading images and creating albums in Photos. If you have years worth of memories stored in Drive, this could definitely be a huge commitment. Here are a few side notes that didn’t fit anywhere else. When you upload a photo and download it, the original file name stays intact. Having an easily accessible trash is convenient. 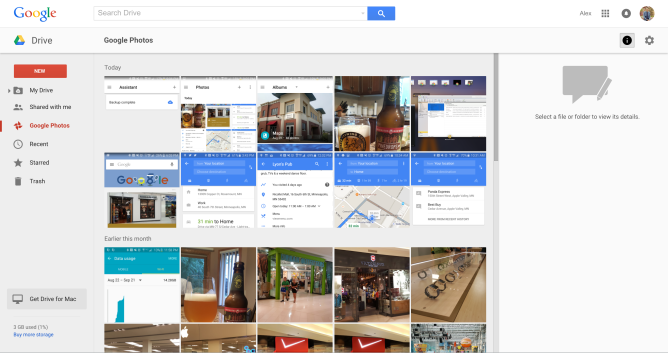 I know it was in G+ Photos, but the navigation for everything there was messy. 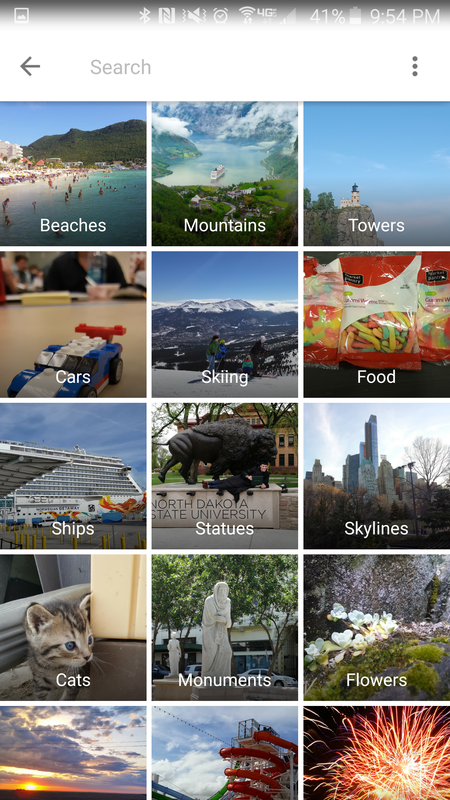 Google+ Photos did a good job of creating collections of photos, but I always felt that managing collections/albums was messy. Now that there is a clearly defined section for everything, it is a lot easier to navigate. It also does a great job of creating collections for you. 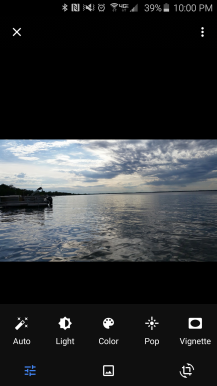 The foundation that Google has created with Photos is great. The unlimited storage for High Quality photos is a game changer in the world of storing photos online. I look forward to seeing the improvements and revisions they make over time. 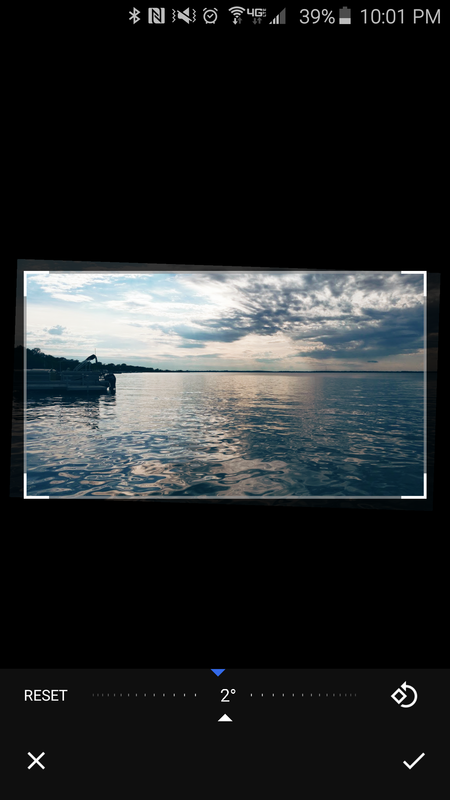 The mobile application allows you to properly view photospheres, but the web app does not. Sometimes collections can take a little while before they appear. I have had them show up in Assistant up to 8 hours after uploading the album. If you haven't had one show up yet, it’s probably best to just sit tight and wait. 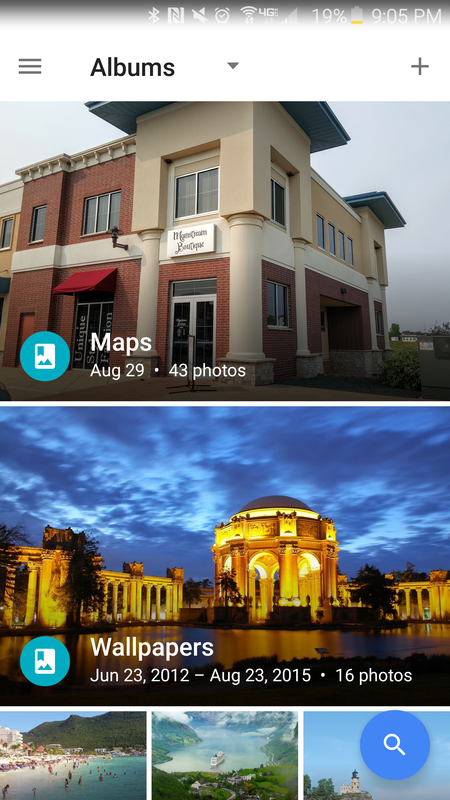 Overall, Google Photos is a huge improvement over Google+ Photos. Features like automatic backup, unlimited storage, and a slew of creepy ways to explore your pictures make it a no-brainer for many people. 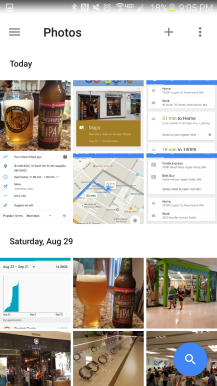 If you haven't already tried it out, go to the Google Photos web app, or download it from the Play Store.